HOSNI MUBARAK, THE former Egyptian autocrat toppled during the 2011 Arab Spring, left a military hospital today where he spent much of the last six years in detention. The release of the 88-year old who ruled Egypt for three decades would have been unthinkable several years ago, but revolutionary fervour gave way to exhaustion and even nostalgia in the uprising’s chaotic aftermath. “Yes,” his lawyer Farid al-Deeb told AFP when asked if Mubarak had left the hospital today. He added that Mubarak had gone home to a villa in Cairo’s Heliopolis district. He was sentenced to life in jail in 2012 in the case, but an appeals court ordered a retrial which dismissed the charges two years later. Egypt’s top appeals court on 2 March acquitted him of involvement in the killings. Throughout his trial prosecutors had been unable to provide conclusive evidence of Mubarak’s complicity – a result, lawyers said, of having hastily put together the case against him in 2011 following demonstrations. Yesterday, a court ordered a renewed corruption investigation into Mubarak for allegedly receiving gifts from the state-owned Al-Ahram newspaper. He is also banned from travel. Meanwhile several key activists in the 2011 uprising are now serving lengthy jail terms, and rights groups say hundreds of others have been forcibly disappeared. The international human rights organisation Reprieve said that Mubarak had been released while hundreds more face the death penalty. Deputy director Harriet McCulloch said: “As Hosni Mubarak goes free in Egypt, thousands of prisoners still languish in horrific conditions. The Sisi government must show that Egypt’s justice system is worthy of the name and release Ibrahim [Halawa], and the hundreds like him. The anti-Mubarak revolt ushered in instability that drove away tourists and investors, taking a heavy toll on the economy and leading to nostalgia for his rule. His successor Mohamed Morsi, an Islamist, ruled for only a year after his 2012 election before the military overthrew him, prompted by massive protests against his Muslim Brotherhood group. Morsi’s overthrow ushered in a deadly police crackdown that killed hundreds of protesters demanding his reinstatement. The military chief who toppled him, Abdel Fattah al-Sisi, won election as president the following year. Morsi’s overthrow helped rehabilitate some Mubarak-era politicians, including a former senior member of his National Democratic Party who served as prime minister under Sisi. Most of Mubarak’s associates have been cleared in corruption trials, and police officers charged with violence during the revolt have been acquitted. “Mubarak’s trial lasted six years and public opinion became bored of it,” said Mostafa Kamel al-Sayed, an analyst and political science professor in Cairo University. Sisi and the powerful military have not fully embraced the former regime, and continue to praise the January-February revolt that brought it down. But critics say they have limited freedoms even more than Mubarak. Some who participated in the protests against Mubarak said they felt the uprising was in vain. “Honestly, I found that all of that was useless,” said Ahmed Mohamed, 29. Mohamed had been among the thousands of protesters who took to Cairo’s Tahrir Square demanding Mubarak’s fall. “Mubarak’s time was a lot better in all aspects,” he said after the prosecution ordered Mubarak’s release. 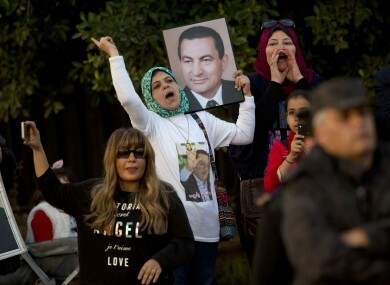 In the few years before his overthrow, Mubarak had begun to loosen his grip on political life and the media, allowing for some protests and criticism. But police abuses and economic grievances remained. Email “Former Egyptian president who was ousted in the Arab Spring gets out of jail”. Feedback on “Former Egyptian president who was ousted in the Arab Spring gets out of jail”.